lol. 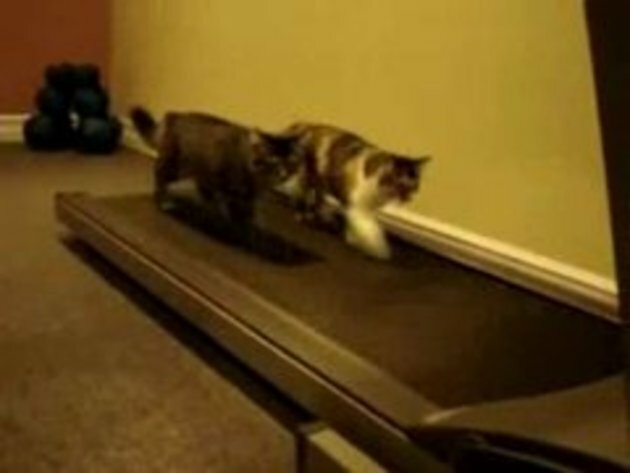 What i wanted to see was the guy to stop the treadmill exactly after the white cat was running fast to see what happens. Someone actually has a cat with stamina? Is it genetically altered or something? My cat barely gets up to get some food.. Some nights he catches a bird or something, but then usually takes a four week vacations afterwards.. I'm not sure which was funnier, the cats on the treadmill, or listening to the lady laugh!! I want to say "awww, poor kitty's" but I don't really like cats, so I thought it was pretty dang funny!! I love cats... Seems two people here(#6 & #(removed comment))don't like cats and are sick saying that it was funny. It was cute and funny but how they were laughing and making it go faster was kind of mean and sick. so funny, the head shake at :59 is awesome.